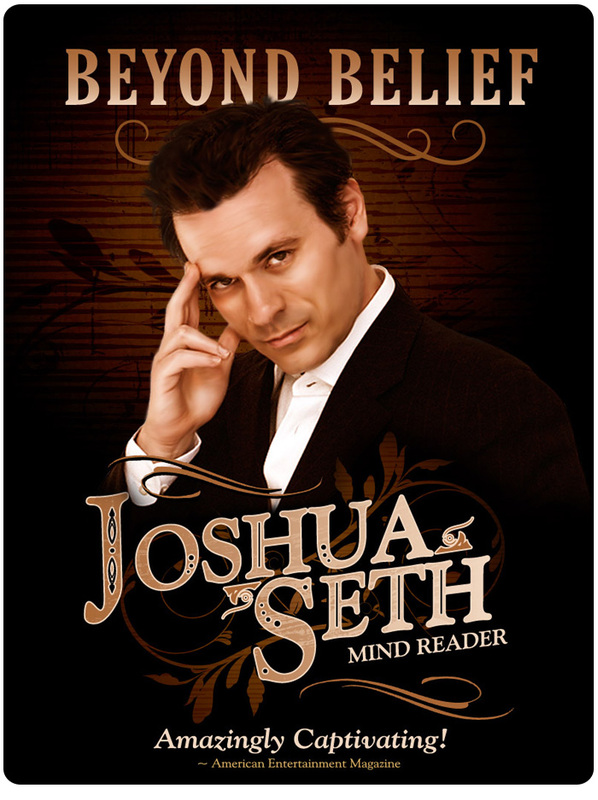 Giggio user Joshua Seth tours the world as an entertainer, speaker, author, and voice over actor. As a stage entertainer, he's won awards from Hollywoodʼs famed Magic Castle and was nominated as "Best Male Entertainer" and "Best Live Variety Show" by Campus Activities Magazine for his mind-blowing mystery entertainment. Joshua spoke to us from his home in Florida. "I’m pretty well known as a voice actor in Hollywood for a variety of Cartoon Series, Television and Movies as well. I think IMDB says my voice is featured on 65 animated TV series and movies. Hundreds of episodes, thousands of commercials, tens of thousands of promos. However, my heart was always with live variety entertaining - that’s where I started. After a number of years doing that in Los Angeles, my tour schedule got to be so heavy, that I had to make a choice. Whether to recommit to my live performing, or just make it all about the voiceovers. I went with my heart, which I always recommend people do, in an economic opportunity anyway, and it proved to be a fantastic adventure. I’ve been on tour now fairly non-stop for about 8 years with both a live mentalism show and a comedy hypnosis show. I do theatres, lots and lots of colleges, a good amount of corporate shows, and I’ve headlined on about 150 cruise contracts all over the world. As long as I’m in front of a crowd with a microphone, I’m happy. I’ve done some television appearances overseas - those are always really interesting and very different to what I’m accustomed to. I’ve had two of my own of televisions specials in Japan, two more South Korea in the last couple of years, plus another one in New Zealand. So 5 TV specials that have featured my Hypnosis and Mentalism. I’m a very happy user of Giggio! I’m not doing birthday parties - I’ve done my share in the past! It seems to me that a lot of the out of the box systems that are meant for variety entertainers are meant for that market. The ‘Local’ market in other words. And those things don’t fulfil my needs as a touring entertainer. I’ve tried just about everything that’s out there and found them lacking in terms of the features that I needed. A long time ago I used to use ACT!, but I’m very much an Apple person and I like all the Mac products, and ACT! is not something that exists on the Mac. So I tried their workarounds. I tried Filemaker. I tried Bento, which is not supported anymore. I used Daylight which I found to be way overkill. I even used a very expensive cloud based program called Salesforce - way overkill! A lot of the things that did have the features that I needed were too cumbersome for me to bother using. And a lot of the out-of-the-box programs that are meant for variety entertainers didn’t fulfil what I needed as a touring entertainer. Then I found Giggio. Da-da-da! When I first started I almost passed it by because it was so English with it’s Pound Symbols and ‘Surname’! You have to put in your country, and your dollar symbols for the US. But these were small things. I’ve emailed you guys with a couple of ideas and they’ve all been integrated. You’ve been very responsive. If anybody likes the ‘Next Tasks’ feature that’s on the Dashboard now - that was my idea! The reason I wanted that is because I’ve also written books and I give presentations, as well as shows, and sometimes these presentations require a different kind of setup. For instance I’m looking right now and this particular one says I need to copy 200 CDs that the client purchased in advance. So, that’s my Next Task and it’s linked to the event that I’m performing. So if I were doing a show and needed to bring promo, I could also put that as a Next Task and it’s right there on the front page. Like a To Do list that relates to these upcoming events. It’s a pleasure to use. It’s enjoyable to use. Even if another database program fulfils what you technically need, if it’s stressful to use, I’ve found I tend not to use it. Where as, with Giggio, I actually enjoy opening it up. I like using the interface. It’s clear, easy to understand, a fairly stress-free experience, not to difficult to setup in the first place. Some of these are monsters! But this has filled just about everything I need. In fact, I’m in the midst of planning a rather big corporate event in Vegas, for which I had to hire half a dozen magicians to work the room prior to my headline spot later in the evening. I was happy to find that I’m able to add all of those people as sub-contractors from within my Giggio account and I didn’t even need to upgrade to the agency level to do it. If I keep doing this, and adding people I will, but it’s nice to know that’s there and I don’t have to start over if that part of my career expands. I took the 30 day trial, but pretty quickly I ended up paying for it because I realised that this hits all the required buttons. It’s got better over time too. One of the nicest things right off the bat about it is that it made my contracts and invoices look so much better because of your templates. I found customisation of these to be a pretty straightforward, easy, process. It’s night and day from what I was doing before - I was using Pages to erase and fill in information from the previous contract each time. Then I’d resave it with the new name. Erasing, typing, erasing typing… It meant it could have a name or date from an old contract! And then I had all this stuff saved somewhere on my laptop and sometimes the organisation is lacking. Where as, now, all that information is right in the Giggio interface. I also real like that I can download everything to iCal. So it pops up on my iPhone or on my iPad and laptop and I don’t have to copy and paste all of that gig information. It tells me not only the when, where and what, but it includes all of the details from the ‘notes’ section of Giggio, right in the calendar. Automatically propagated to all my devices. It’s been a pleasure using Giggio!"